As one of the three Scandinavian countries, Norway has the unusual distinction of being both the westernmost and easternmost of the group. Embracing Sweden and Finland, Norway is a vast country where the land is both harsh and beautiful and the rocky wilderness hides amazing natural landscapes. While the oil and seafood exports are the backbone of the Norwegian economy, nature explorers and tourists with an eye for beautiful geography are drawn in year after year. The tourism industry revolves around this variety of landscapes that extend across the cold of the Arctic Circle. Most consider the main attraction to be the fjord coastline but many visitors also enjoy staying at ski resorts and exploring the lakes and snow covered woods. Norwegians take pride on keeping fit and enjoying sports so visitors can expect a variety of options for their trip. In winter, you can try cross-country or alpine skiing and snowboarding. In the summer the climate is gentle and both hiking and biking become a great way to enjoy an outdoors vacation. 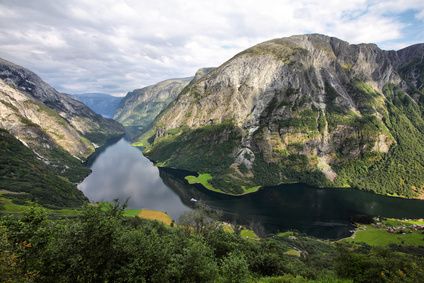 Norway enjoys the highest concentration of fjords in the entire world. These are long and narrow inlets surrounded by steep cliffs; passageways carved into the stone and rock by glacial activity during successive ice ages. Fjords can be considered nature’s own works of art, formed as the glaciers retreated and the sea water flooded the valleys that remained. Flåm is an excellent choice for those who wish to sign up for a visit to the Norwegian fjord coastline. The area surrounding this village enjoys some of the most extreme and beautiful fjord scenery and offers a variety of “fjord safaris.” These experiences get you right into the thick of things, as you explore the fjords at close range in rigid inflatable boats. During the trip, there will be frequent stops when you’ll be able to appreciate some of the local wildlife and see the old settlements perched on the high mountain sides. Visiting the fjords is an excellent option for travellers who like to appreciate natural marvels and are willing to get out of the crowded cities to enjoy the humbling visage of towering cliffs and thundering waterfalls. If you would like to experience Norway for yourself, we recommend going during either Autumn or Spring. While Summer enjoys the most stable temperatures (and long warm days) it is during these two seasons when the country blooms with colours and you can enjoy most of its natural charm. Regardless of your choice, remember that climate is always fickle on mountain country and be prepared for an adventure. Skiing in Norway is pretty cool… a bit expensive though. Make sure you purchase a Alpepass… it will give you access to heaps of mountains and save you dollars.